The F. Gutekunst Company of Philadelphia produced this small portrait of a young Charles Brockden Brown while located at 712 Arch Street between 1864 and 1886. 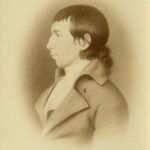 From 1798 to 1801 Brown published seven novels; he wrote his first, Wieland; or, the Transformation: An American Tale, at the age of twenty-seven. This image is a mass-produced collectible print, reflecting continued popularity of his Brown's work after his death in 1810. Charles Brockden Brown depicted Philadelphia as a city in chaos during the yellow fever epidemic of 1793. The epidemic occurred during Philadelphia's decade as capital of the United States. By the end of the decade, William Birch depicted a more sedate city in his series of prints, published in 1800. 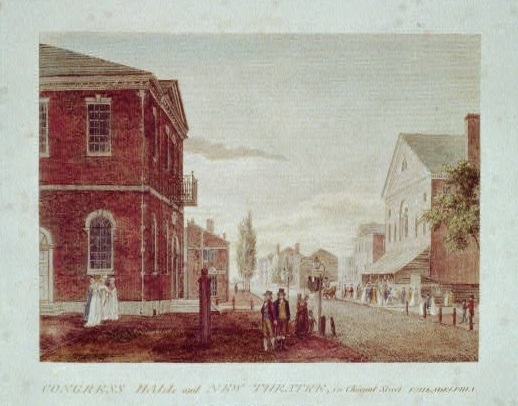 This plate depicts Congress Hall (left) and the New Theater on Chestnut Street. Arthur Mervyn; or, Memoirs of the Year 1793, published in 1799 by Philadelphia native Charles Brockden Brown (1771-1810), became one of the most influential works of American and Philadelphia Gothic literature. The novel recalls the yellow fever epidemic (August–October 1793), which transformed Philadelphia into a place of chaos. Such late-summer epidemics were common across North America at the time, but the Philadelphia outbreak proved to be especially fierce, claiming an estimated five thousand lives while the city served as capital of the United States. Subplots of Arthur Mervyn connect the yellow fever epidemic with the turmoil of the American Revolution and the deadly financial networks of the Atlantic slave trade. 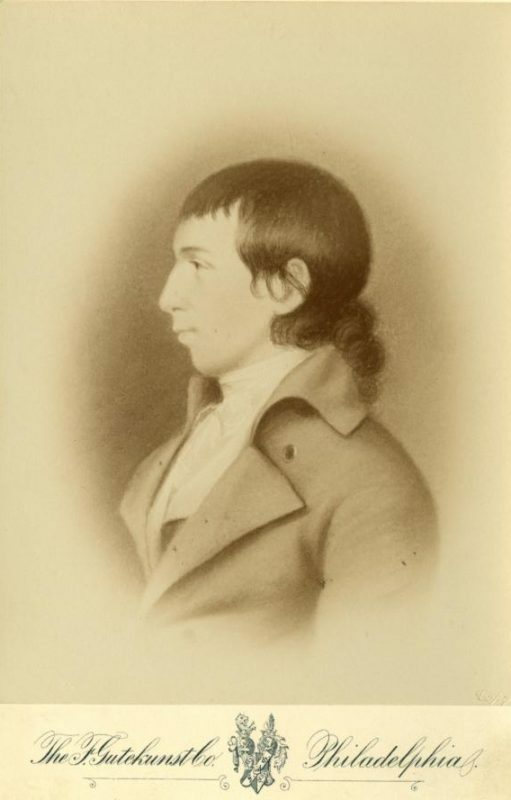 Brown grew up in a Quaker family in revolutionary Philadelphia. His father, Elijah Brown (b. 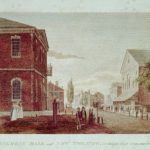 1740), was among the members of the Society of Friends to be deported from Pennsylvania to Virginia because they would not affirm allegiance to Pennsylvania during the war for independence from Great Britain. At six years old, Brown could hear the firing of cannons and musket shots and feared the persecution of his family. These events helped to spur his imagination and form his literary aesthetic. Especially inspiring to the writing of Arthur Mervyn was Brown’s contracting of yellow fever in New York in September 1798. Arthur Mervyn began as a serial in Philadelphia’s Weekly Magazine of Original Essays, Fugitive Pieces, and Interesting Intelligence, but it had to be discontinued due to a lack of enthusiasm among the magazine’s correspondents and the editor’s death from yellow fever. The end of the serialization pushed Brown to issue the book on its own. Arthur Mervyn combines two stories, although it is often read as a single narrative. The first component of Arthur Mervyn was published as a full-length work between March and May 1799. The “sequel,” as Brown understood it, was published in September or early October 1800, as Arthur Mervyn; or, Memoirs of the Year 1793. Second Part. The 1800 follow-up became very rare, and few collectors in later years found it possible to obtain both volumes separately. The novel follows the actions of protagonist Arthur Mervyn, a farm boy who leaves a rural area to move to Philadelphia, and the challenges he faces. After being exiled from his father’s farm, Mervyn arrives penniless to a city riddled with yellow fever. He was cheated out of all his money on the trip there. When readers first meet Mervyn it is through the eyes of Dr. Stevens, who finds him ill with yellow fever and takes him in. Mervyn recounts everything that brought him to that desperate position. The novel’s villain, Mr. Welbeck, is a constant adversary for Mervyn, as he is a thief and forger whom Mervyn met when he was begging for money. Mervyn gets wrapped up in Welbeck’s wrongdoings and ultimately escapes back to the country. The first part of the novel is narrated by Dr. Stevens, the second part is narrated by Mervyn. The novel’s subplots reflect the author’s experiences growing up in a Philadelphia Quaker merchant family during the era of the American Revolution and Quaker activism against slavery. Arthur Mervyn includes reflections on slavery and dramatizes financial institutions, practices, and legal concerns surrounding the slave trade. Many nameless slaves, bound servants, free blacks, and laboring-class whites featured in Arthur Mervyn embody the shifting class and racial social organization of the late eighteenth and early nineteenth centuries. Scholar James H. Lustus has linked the physical impact of the yellow fever to the symbolic manifestation of moral “pollution,” a word Mervyn frequently uses in the novel. The term embodies the licentiousness, greed, and deception permeating Philadelphia at the time. Arthur Mervyn ends with the protagonist marrying Achsa Fielding, a rich widowed Jewish woman, an act that illustrates the character’s new approach to social relations. With novels like Arthur Mervyn, based on historical precedents, Brown attempted to persuade readers that novels could extend beyond imagination to provide communal truth. The critical reception of Arthur Mervyn has been contradictory, with scholars debating whether the Mervyn character is a hero or a scoundrel, or, as one critic argued, lacking “the force of will to be either” hero or villain. Mervyn often has been cited as an unreliable narrator. Critics also have found the novel’s narrative structure to be confusing, with stories frequently told from several points of view. Arthur Mervyn inspired other American Gothic authors, including Edgar Allan Poe (1809-49), who also spent time in Philadelphia and whose “The Masque of the Red Death” (1842) is about a fictitious disease that plagues a fictitious country. For Brown, the novel served as an opportunity to reflect on his childhood and the challenges he and his family faced during the American Revolution. He used the work to free himself from the past and in turn helped to influence a new literary genre, the American Gothic. Kristi Collemacine is an English M.A. candidate at Rutgers University-Camden, where she is a part-time lecturer. She also teaches at the Community College of Philadelphia. Brown, Charles Brockden. Arthur Mervyn, or Memoirs of the Year 1793: With Related Texts. Edited by Philip Barnard and Stephen Shapiro. Indianapolis: Hackett, 2008. Davidson, Cathy N. Revolution and the Word: The Rise of the Novel in America. New York: Oxford University Press, 2004. Ferguson, Robert A. “Yellow Fever and Charles Brockden Brown: The Context of the Emerging Novelist.” Early American Literature 14, no. 3 (1979): 293-305. Garvin, Kristina. “Corporate ties: Arthur Mervyn’s Serial Economics.” Early American Literature no. 3 (2015): 737. Justus, James H. “Arthur Mervyn, American.” American Literature 42, no. 3 (1970): 304-24. Kafer, Peter. “Charles Brockden Brown and Revolutionary Philadelphia: An Imagination in Context.” Pennsylvania Magazine of History and Biography 116, no. 4 (1992): 467-98. Russo, James R. 1979. “The Chameleon of Convenient Vice: A Study of the Narrative of ‘Arthur Mervyn.’” Studies in the Novel 11 (4): 381. Arch Street Friends Burial Ground (burial place of Charles Brockden Brown), Fourth and Arch Streets, Philadelphia.